Mahjong, mah-jong or mah-jongg is a Chinese game that dates back more than 2,000 years. The ancient game takes patience to learn and requires a bit of strategy to play. Beginner's usually practice the game process without keeping score until they have mastered the concept of the game. Beginner's will learn their roles in the game, how game play progresses around the board and the sequences to make the Mahjongg tiles in order to win a hand. Allow each player to roll a pair of dice. The player with the highest sum total becomes the dealer for the hand and is referred to as the East. The player to the immediate left of the dealer is South, across from the dealer is West and to the right of the dealer is North. Mahjongg does not require four players, though the rules change when players join or leave the game. Start with the dealer and take turns drawing four tiles at a time, moving counter-clockwise. Stop when each player has 12 tiles and then have each player draw a 13th tile. Set your hand of tiles up by grouping tiles together according to suits. Much like the game of Rummy, you will attempt to make groupings of three or four tiles. The groups you will try to make are known as Kongs, Pungs and Chows. Kongs consists of four identical tiles while Pungs are groups of three identical tiles. Chows are three tiles that create a consecutive number sequence and are of the same suit. Throw away any tiles in your hand with a flower or season on the cover. Place these tiles face-up in the center of the game table and draw a new tile out of the face down pile of remaining tiles. Allow the dealer to start by drawing a tile from either pile of tiles in the center of the table. The game play will move clock-wise as players take turns picking up and discarding tiles. Continue around the table until a player has a winning hand that will consist of three Pungs or Chows and a pair or three Kongs and a pair. 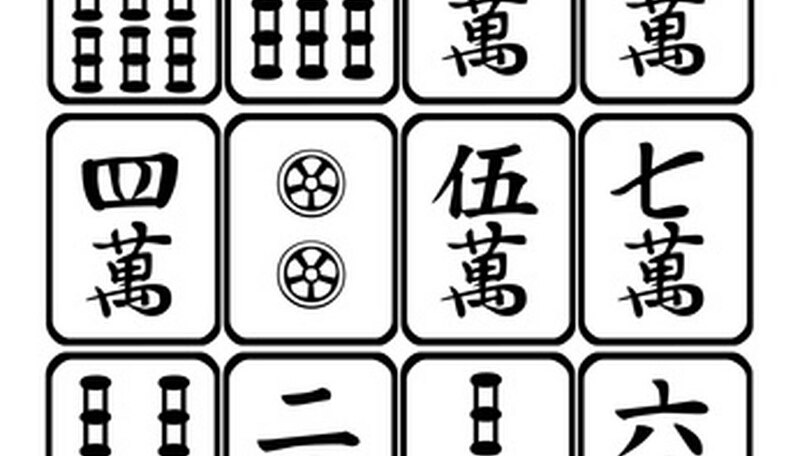 There is a scoring system for Mahjong, but newcomers simply place a mark on a piece of paper next to the name of the person with the winning hand. Repeat the above steps until you have played a total of 16 hands. The player who wins the most hands out of those 16 is the winner of the entire game.